As part of our commitment to supporting artists’ professional development, we are offering 25 places for a-n members to remotely access a series of mentoring sessions with one of five visual arts mentors. Who can apply: a-n Artist members, Joint (Artist and Arts Organiser) members, Arts Organiser members. What: 4 x 1 hour fully subsidised mentoring sessions with visual arts mentors: Bill Campbell, Rosalind Davis, Lucy Day, Amanprit Sandhu, Emilia Telese. When: Mentoring sessions will start in September 2018 and take place over 1 year. It is for you and your mentor to decide when each session takes place. Deadline for applications: 11am, Monday 23 July 2018. Following the success of a-n’s one-to-one guidance sessions in 2017, the a-n Mentoring programme is a new strand of professional development support for a-n members. a-n is working with five independent visual arts mentors: Bill Campbell, Rosalind Davis, Lucy Day, Amanprit Sandhu, and Emilia Telese to offer a year-long programme of mentoring sessions for both artist and arts organiser members. Mentoring sessions are offered remotely, with contact either by phone or video call making sessions flexible and accessible. Each of the 4 sessions will last 1 hour and will be undertaken over a 12-month period from September 2018. Mentoring is a supportive, long-term relationship between two people – an experienced ‘mentor’ and less experienced ‘mentee’. A mentor takes an advisory role to support you in developing your professional career, with a longer-term view in developing and articulating future goals. Mentoring can provide you with an opportunity to think about how you might progress in your artistic career and get advice on professional development related issues. You will benefit from your mentor’s knowledge, insight and experience in the visual arts. A mentor can act as a sounding board, prompt you to consider different perspectives, guide you towards solutions or challenge you to think and behave differently. Your mentor may set you goals or tasks to complete between sessions to progress your development. 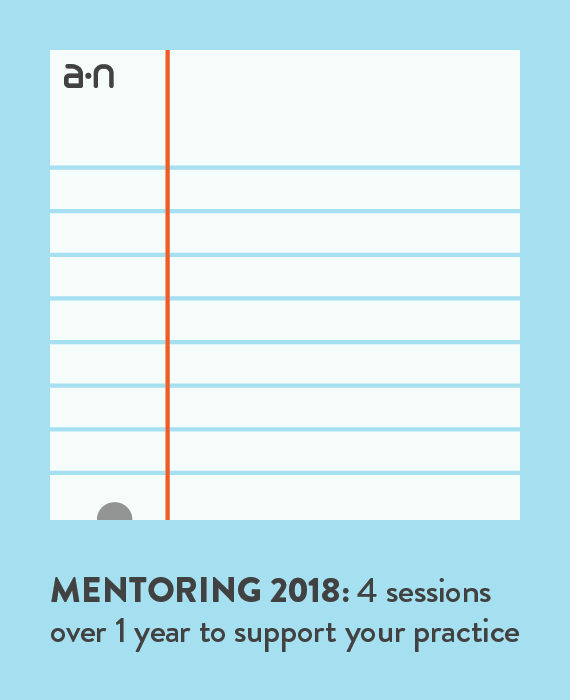 The a-n Mentoring programme offers four one-hour sessions with a mentor over a 12-month period concentrating on the professional side of your practice, rather than focussing solely on how or why you make the work that you do. Based on your application we will match you to the mentor we feel best suits your needs. Your mentor will prepare for the sessions using the information provided in this application, alongside a brief survey we will you send prior to the programme commencing. The focus of the first meeting will be getting to know each other, and agreeing mutual expectations of the mentoring and the mentee’s goals. The last meeting will focus on review and setting ongoing objectives. Guidance in proposing work for exhibition. Fundraising as an individual or for a project. Working in the public realm. At an early stage in your career, or following a career break an experienced mentor can help you navigate a range of concerns and challenges. If you aren’t sure of a particular need and are looking for general advice and development support this might be best suited to a mentor. They can offer broader advice on navigating the visual arts and your professional development in the sector. In addition to a-n Mentoring, we are also offering the 3-6 month a-n Coaching 2018 programme. Mentoring and coaching are sometimes discussed as though they are interchangeable, but this isn’t the case. To help understand which might be the best fit for you, find out more about the benefits and differences between mentoring and coaching in a-n’s Resource guide Coaching or Mentoring: which is right for you? Bill Campbell, is Founder and Director of Islington Mill, a leading independent space for artists to live, create and showcase their work, based in Salford. Islington Mill produces innovative inter-disciplinary public arts programmes and artist residencies alongside studio spaces. Campbell has held a number of advisory roles including Board Member of Sounds from the City, an annual live music and performance festival. In 2011 Campbell was awarded the Master of Arts honoris causa by the University of Salford in recognition of outstanding achievements as a Salfordian and contribution to the creative industries within the city of Salford. In 2015 Campbell completed the Clore Fellowship programme which included two residential courses across the year, alongside group workshops focusing on areas including fundraising and philanthropy, public engagement, financial management and strategic planning. Rosalind Davis is an artist, curator at Collyer Bristow Gallery and a graduate of The Royal College of Art (2005) and Chelsea College of Art (2003). Davis previously co-directed and developed two innovative and dynamic artists’ educational, membership and exhibition arts organisations based in south east London – Zeitgeist Arts Projects (2012-15) and Core Gallery (2009-11). Curatorial projects have also been at Arthouse1 Gallery, Standpoint Gallery, Geddes Gallery and with ZAP at Bond House Gallery (ASC). Davis is co-author of What they didn’t teach you at art school. Davis lectures at universities, galleries and art organisations across the country including at the Royal College of Art, the ICA, Camden Arts Centre, University of the Arts and Artquest, teaching a range of artist professional development subjects, as well as short courses in social media marketing and arts management at UAL. Davis has mentored for a number of years including for a-n, Shape, UKYA (where she is also an ambassador) as well as independently. As an artist Davis has exhibited nationally and internationally in a wide range of galleries and has had a number of solo shows in London. She is also a member of the Undead Painters, a painting forum and exhibiting group. Lucy Day is Director of A Woman’s Place Project CIC and a curator with many years experience developing exhibitions in private, public and artist led spaces. She graduated as an artist from Norwich School of Art in 1989 before working for SPACE Studios for five years, leaving in 2005 as Director of Arts Training and Resources and Co-Director of Exhibitions. A Woman’s Place was founded to question and address the contemporary position of women in the creative, historical and cultural landscape In 2018 ‘A Woman’s Place at Knole’ launched new commissions by Lubaina Himid, CJ Mahony, Lindsay Seers, Emily Speed, Alice May Williams and Melanie Wilson at National Trust Knole. In 2006 Day formed curating partnership Day+Gluckman with Eliza Gluckman. They have worked with a variety of organisations and spaces including: Collyer Bristow LLP, V&A, National Trust, Plymouth City Museum and Art Gallery, Plymouth Arts Centre, Newlyn Art Gallery, Bexley Heritage Trust and the Canal and Rivers Trust. Day has supported artists and arts organisers through mentoring, workshops and organisational change. She has worked with a-n since 2010 leading Navigating the Art World and What’s It Worth workshops and regularly works with Artquest. She is Visiting Practitioner for University of the Arts London (Wimbledon College of Art) and lectures at art colleges nationally, and is also a commissioned writer on visual arts practice and exhibitions, a Fellow of the Royal Society of Arts and a Clore Leadership short course alumnus (Clore50, 2017). Amanprit Sandhu is a curator based in London, with a particular focus on the commissioning in the public realm and performance based practices. She is the co-founder of the curatorial collective DAM Projects, alongside Daniella Rose King and Morgan Quaintance. Inclusive and anti-elitist, the collective uses temporary exhibitions and events to support emerging, underexposed and unorthodox artists, art scenes, discourses and debates. ‘Sunday School’, its series of 12 one-day exhibitions ran from November 2014 – November 2015, featuring six solo shows from recent UK art school graduates and six exhibitions looking at emerging international art scenes. Sandhu is currently Programme Curator of Residencies and Public Programme (Maternity Cover) at Camden Arts Centre. She has previously held the roles of Project Curator at Art on the Underground, curated the performance programme for both Art 13 and Art 14 London art fairs and produced a series of commissions for the 2014 Folkestone Triennial. Previous to this she was Project Manager for Frieze Projects and Assistant Curator at the Liverpool Biennial of Contemporary Art. Amanprit is also a Trustee for Arts Catalyst. Emilia Telese is an award-winning artist, writer and academic. A graduate of the 600-year-old Academy of Fine Arts in Florence, living in the UK since 1997, her practice spans several art forms, from interactive and body-responsive technology, film and live art to installation and public art. She has exhibited worldwide since 1994, including at Ars Electronica, ZKM, Venice Biennale, the Louvre, Paris and the Freud Museum, London. A former Arts Council England regional member and Artists’ Networks Coordinator for a-n, Telese is passionate about the financial sustainability of artists’ work. She is a specialist in professional practice for artists, lecturing and speaking at over 30 UK and European art institutions and organisations. Since 2001 she has created and led Dodge The Shredder, a series of workshops empowering artists to fundraise effectively and create a financial strategy for their practice. Dodge the Shredder has been described as the leading workshop of its kind in the UK. Telese is a CDA AHRC PhD researcher in Cultural Policy at the University of Loughborough in partnership with a-n The Artists Information Co, looking at the economic value of artists in the UK economy. You must be logged in to access the form. Only current Artist, Joint (Artist and Arts Organiser) and Arts Organiser members can apply. The form is available until 11am, Monday 23 July 2018. What areas of your professional development do you want to explore through mentoring? Who would be your preferred mentor? To upload your current CV (in pdf format) and link to your website. Equality and Diversity monitoring information (this information is separated, anonymised and does not form part of the selection process). You can save the form mid process and return to it – you must save the link you are provided with and can email the link to yourself. You will not be provided with a copy of the final application after it is submitted so we recommend you save your own copy. Current a-n Artist, Joint (Artist and Arts Organiser) and Artist Organiser members. Become an a-n member here. a-n members are welcome to apply for both the a-n Coaching and Mentoring opportunities, but will only be offered one place. 2. What is the selection process? The impact mentoring will have on the applicant’s practice and continuing professional development. The need for support – is this the right time for the applicant to benefit significantly from mentoring? Does the applicant have clear goals for the mentoring programme? Applicants will hear back if their submission has been successful or unsuccessful by the end of August 2018. 3. Why does a-n offer mentoring? Support artists’ practice and ongoing professional development. Enable artists to self-determine and tailor professional development to their needs. Maintain and develop a more diverse, engaged and resilient professional membership. 4. What can’t be supported? Applications from students on an undergraduate course. Applications from artists without a current a-n membership. Applications from members who have already accepted an a-n Artist Bursary 2018, a-n Biennial Bursary 2018, or a place on the a-n Visual Arts Coaching Course in 2018. Applications from members who received a one-to-one guidance and advice bursary in 2017. Any incomplete applications or applications received after the deadline of 11am, Monday 23 July 2018. Any joint applications that are submitted via a single form. To apply as a duo both applicants must submit an application form each, making it clear that it is part of a joint application clearly stating the joint applicants name. Each application will be reviewed on its own merit, and a decision will be made to accept both, one or neither applicant. Applications from groups or collectives with more than 2 members. In submitting an application, you confirm that you meet the eligibility criteria (See ‘Who can apply’ and ‘What Can’t Be Supported?’ above). Unfortunately, a-n can’t respond to requests for advice in shaping applications. We advise not leaving the sending of your application to the last day. The decision to award or not is at the discretion of a-n The Artists Information Company. Accepting an offer of mentoring comes with the obligation to produce a blog on a-n.co.uk/blogs. The blog is not about the sessions themselves but about your practice and its development and to enable learning and progress to be shared with the artists’ community on a-n Blogs. Blogs can be completed by text, video, audio and/or images – guidance will be sent to successful candidates. Accepting an offer of mentoring comes with the obligation to commit to four x 1 hour sessions during the programme. a-n will share guidance for mentors and mentees to all successful applicants to clarify expectations and boundaries for the sessions. Successful applicants will be asked to complete a short survey prior to the sessions beginning in order to set a baseline for evaluation. By accepting a bursary offer you commit to taking part in evaluation of the bursary programme and providing feedback following activity completion. All conversations between a-n members and coaches will be treated privately. a-n members will only be able to accept one a-n member opportunity each in 2018. Coaching or Mentoring: which is right for you? : a-n’s External Programmes and Partnerships Manager Hannah Pierce offers advice on the benefits to artists of mentoring and coaching, and highlights some of the differences between these two approaches to interaction and personal, professional development. Top tips on applying for a-n member opportunities advice on writing applications for a-n’s member opportunities.